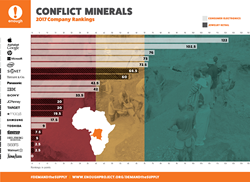 Apple, Alphabet (Google), HP, Microsoft, and Intel are leading the way, while Walmart, Sears, and Neiman Marcus are ranked worst, in the Enough Project’s 2017 Conflict Minerals Company Rankings, published today. The new rankings report examines 20 of the world’s largest consumer electronics and jewelry retail companies on their efforts to support a conflict-free minerals trade and ensure their products aren’t linked to a range of abuses in the Democratic Republic of Congo. Apple emerged as the clear leader with its consistent fulfillment of the rankings criteria indicating that the company has committed substantial resources to developing processes for sourcing minerals from mines that benefit Congolese communities. Alphabet, Google’s parent company, ranks second overall and HP, Microsoft, and Intel round out the top five companies. Signet Jewelers and Tiffany & Co. lead the pack in the jewelry retail industry with other companies from this industry lagging far behind. Overall, 11 companies, including some of the world’s most recognized brands like Neiman Marcus, Sears, and Walmart were ranked in the red, indicating they were making little effort to combat the trade in conflict minerals from Congo. The rankings also clearly indicate that the consumer electronics industry as a whole is more advanced than the jewelry retail sector in corporate efforts to improve supply chain transparency and opportunities for conflict-free sourcing from Congo. The 2017 rankings build on Enough’s 2010 and 2012 consumer electronics rankings and 2014 jewelry leaders review. The results this year highlight the steady advances that have been made since Enough conducted its first company rankings seven years ago and reveal some corporate trailblazers that are supporting a conflict-free minerals trade in eastern Congo. Many of the ranked companies have consistently improved the quality of their due diligence programs, including developing and implementing more sophisticated risk management processes and moving beyond annual reporting. Top-scoring companies are also enhancing their efforts with regard to sourcing conflict-free minerals from Congo and progress in Congo’s mining areas demonstrates tangible impact to which company efforts contribute. As of April 2017, 420 mines in Congo had been verified as conflict-free. In 2010, at the time of Enough’s first rankings, no mines had received this designation. The rankings also expose the considerable need for more action – especially with regard to increasing the opportunities for conflict-free gold sourcing from Congo, and better supporting safe, legal, viable livelihoods in Congolese mining communities – spotlighting companies who do little to ensure they are not contributing to the devastating consequences of the conflict minerals trade. The report highlights that, as a result of the unique leverage they have over their supply chains, multinational companies that profit from Congo’s minerals can help address the links between conflict and mining. Click here for the full company rankings report. For media inquiries or interview requests, please contact: Greg Hittelman, Director of Communications, +1 310 717 0606, gh(at)enoughproject(dot)org. The Enough Project supports peace and an end to mass atrocities in Africa’s deadliest conflict zones. Together with its investigative initiative The Sentry, Enough counters armed groups, violent kleptocratic regimes, and their commercial partners that are sustained and enriched by corruption, criminal activity, and the trafficking of natural resources. By helping to create consequences for the major perpetrators and facilitators of atrocities and corruption, Enough seeks to build leverage in support of peace and good governance. Enough conducts research in conflict zones, engages governments and the private sector on potential policy solutions, and mobilizes public campaigns focused on peace, human rights, and breaking the links between war and illicit profit. Learn more – and join us – at http://www.EnoughProject.org.